Here’s an article I recently wrote about grocery store egg labels for dLife, a wonderful online resource for folks with diabetes. Many chicken-keepers are already aware of the difference “cage-free” and conventional eggs—and that’s part of the motivation for keeping chickens. For you who aren’t aware, this one’s for you. Conventional – Conventional eggs are those that are not labeled Cage-free, Free-Range or Organic. These hens are raised in extremely tight wire cages, allocated 1.3 square feet per bird, and their feed has been treated with pesticides. Contrary to popular belief, laying hens are never fed hormones or steroids—but they are routinely fed antibiotics. (A recent study found traces of a class of antibiotics banned by the USDA in 8 of 12 samples across multiple states—yikes!) According to a report from United Egg Producers, 95% of all hens are raised in the “conventional” manner. Cage-free – These eggs come from hens that are raised on the floor, usually in an open barn. The hens have bedding material such as pine shavings on the floor, and have perches and nest boxes to lay their eggs. They, too, only required to have only 1.3 square feet of space per bird. Cage-free eggs are a big step up from conventional eggs, however. The Humane Society cites 16 studies since 2006 finding lower Salmonella rates in cage-free systems vs. conventional, caged systems. Free-range – These eggs come from hens that should be free to go in and out of a barn or protected area, roaming in an outdoor pen for part of the day. However, the size of the space or the level of access to that outdoor space is not regulated. The outside area may be as small as 10 feet by 10 feet for 20,000 hens, is not required to have any dirt or grass, and is usually restricted by a small door, resulting in no meaningful outdoor access for the vast majority of hens raised in this manner. Pasture-raised – These eggs come from hens that are raised on real pasture and able to roam and eat grasses and bugs. This method offers humane treatment of hens, and a style of feeding that most closely mimics their natural behaviors. Hens raised on this system will still be offered supplemental feed, and many will be confined in large pens to protect them from predators. There are no national egg brands offering pasture-raised options, but there are many smaller, local producers, which can be found on the Cornucopia Institute’s Organic Egg Scorecard. 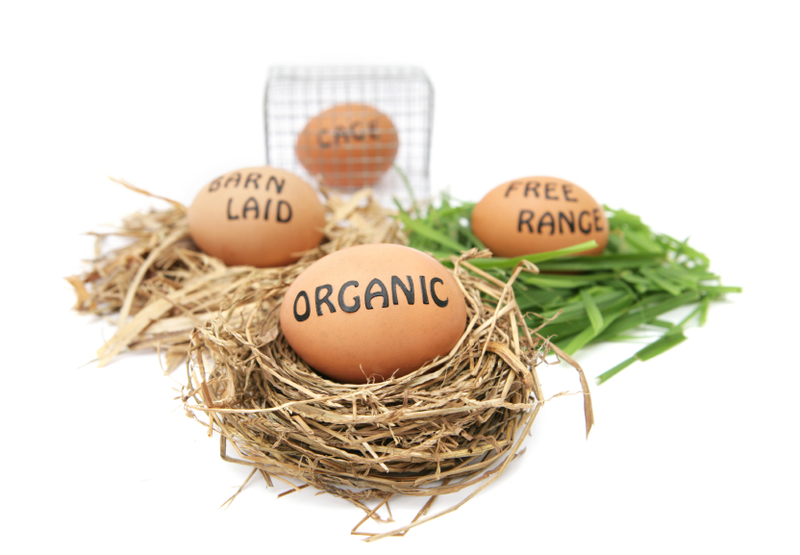 Certified Organic – These eggs come from hens that are raised according to the USDA National Organic Program. Like the cage-free label, organically raised hens are raised in open floor systems and allotted a minimum of 1.3 square feet of space per bird. They are given organic feed and they are not given vaccines or antibiotics. Vegetarian-Fed – These eggs come from hens that are fed a vegetarian diet. Chickens are naturally omnivores, though, and will eat meat if given the chance – especially insects and small rodents – so this is not necessarily a health benefit to you or the hens. We highly recommend you check out the Cornucopia Institute’s Organic Egg Scorecard. It details the type of diet and animal treatment you can eggs-pect from all the country’s major egg producers. You might be surprised to know only ONE national egg producer grants meaningful outdoor space to their hens, for instance! The Scorecard also grades local, smaller-scale egg producers, so you can find one in your area that produces the type of eggs you’re looking for. Of course, you might also consider growing your own! Backyard chickens have become incredibly popular all around the nation for their fun, quirky personalities and gentle nature. Chickens can lay eggs in a rainbow of colors, and they’re bug eaters extraordinaire. If you’re considering keeping a flock of your own, enjoy My Pet Chicken’s free “how-to” chicken care guide. United Egg Producers website, with FAQ. Makes me wish we had them long ago. At least for the last year we have had healthy nutritious eggs from happy hens. My family and I only eat eggs from our backyard chickens. When we first decided to get chickens, I never imagined them to be as cool as they are! Chickens are very beautiful and the eggs are so much better than what we were used to buying from the store. When we ate eggs from our chickens for the first time -over one year ago – we were pleasantly surprised by the difference. The yolks are a beautiful orange color and the taste is incomparable to store bought. It’s been 6 years scince I had a store bought egg and I am not going back.